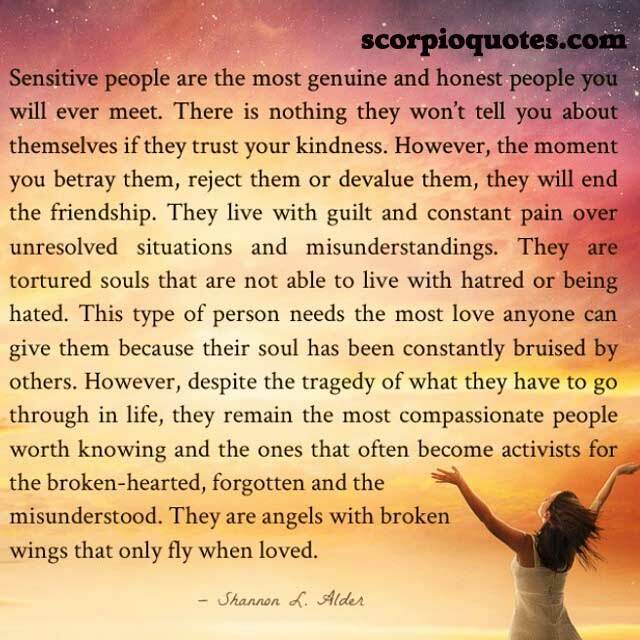 Sensitive people are the most genuine and honest people you will ever meet. There is nothing they won't tell you about themselves if they trust your kindness. However, the moment you betray them, reject them or devalue them, they will end the friendship. They live with guilt and constant pain over unresolved situations and misunderstandings. They are tortured souls that are not able to live with hatred or being hated. This type of person needs the most love anyone can give them because their soul has been constantly bruised by others. However, despite the tragedy of what they have to go through in life, they remain the most compassionate people worth knowing and the ones that often become activists for the broken hearted, forgotten and the misunderstood. They are angels with broken wings that only fly when loved.